Note: This is Part 1 of a Bodhi Surf School report on reducing plastic pollution. 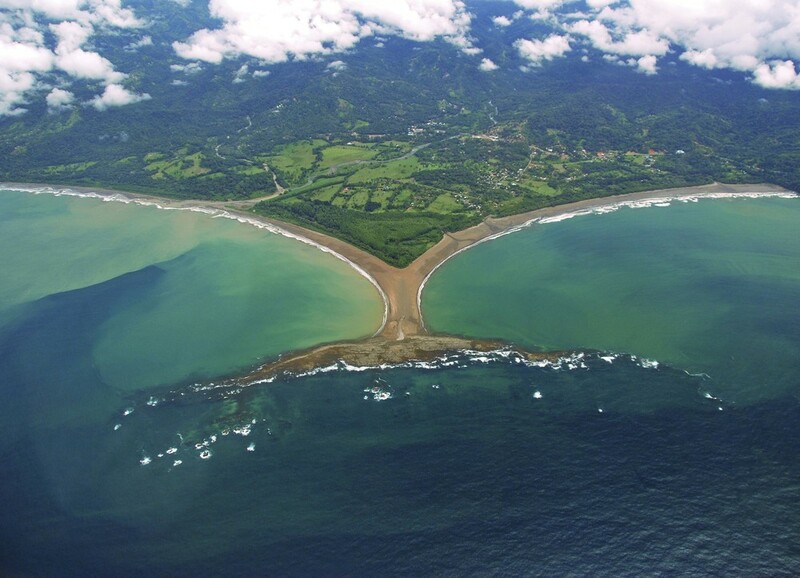 In 2014, Chantal Plamondon and Jay Sinha, founders of the Canadian-based online store Life Without Plastic, entered our Costa Rican-based Bodhi Surf School’s Ocean Guardian Essay Contest, explaining their mission to help reduce plastic pollution in the environment, particularly the oceans, by providing alternatives to plastic products with things made of high quality, durable, non-toxic and natural materials. They won the grand prize—a weeklong family surf and yoga vacation at our school in Uvita, Osa. During their week here last November, Chantal, Jay, and the Bodhi crew naturally bonded over their common roles as environmentally responsible small business owners. We shared ideas around the dinner table, brainstorming ways in which Bodhi Surf and the surrounding community of Bahia Ballena-Uvita could kickstart our journey to become less dependent on plastic. It is always encouraging to see how a series of choices and encounters can lead to profound change. As a current writing intern at Bodhi Surf School, I agreed to take on the task of performing a plastic audit of each room of the business as a side job. It seemed like a worthy cause, though mildly tedious. Little did I know what I would realize in the process. I began the plastic audit by recording plastic cups and spatulas, tallying ladles and toilet seats, and counting electrical outlet covers. Next, I created a spreadsheet of the plastic items, their alternative products, quantity, and cost. The more plastic I discovered throughout the Bodhi Surf compound, the more eagle-eyed I became. I searched high and low for plastic products—raking through cupboards and drawers, busting into bathrooms and closets, and scrutinizing bedrooms and balconies. Soon, I was blown away by the sheer amount of plastic we rely on every day for cooking, eating, cleaning, and going to the bathroom, including spatulas, water pitchers, ice cube trays, toilet seat lids, electrical socket covers... our world was covered in plastic. 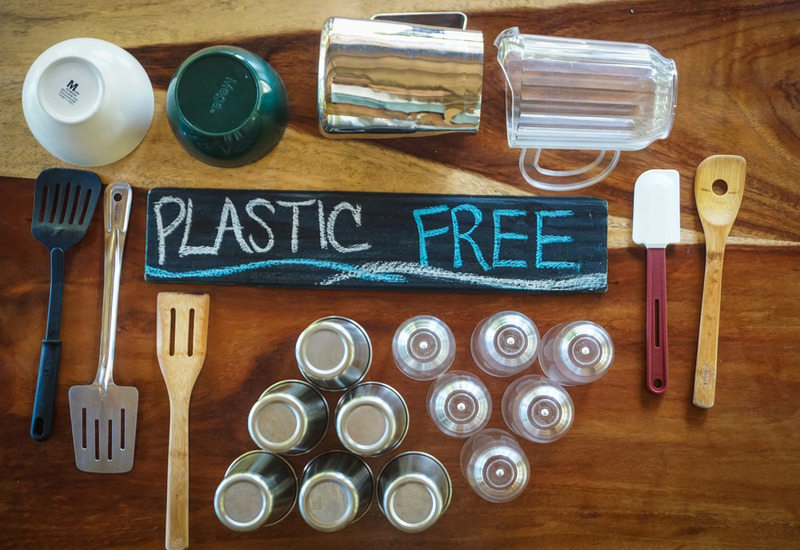 I began to research alternatives to plastic products at Life Without Plastic and on Beth Terry’s blog, My Plastic-Free Life. As I slowly learned the nitty-gritty truth about plastic pollution and harmful BPAs, I realized how unaware I had actually been of my own plastic consumption and the damage that my decisions were causing—to my health and to the environment. Finally, as I watched a video of researchers attempting to extract a plastic straw from a sea turtle’s nose, I knew that I could no longer look the other way. You may have heard that every piece of plastic ever made still exists, since plastic is non-biodegradable and only breaks down into smaller pieces. I imagine that every plastic item I have ever purchased is covering the earth with an unbreathable sheath of toxins. I know—it’s a shocking, depressing image—a world tucked into bed with a plastic blanket. But, our minds must sometimes encounter extremes in order to ignite the spark that will be the catalyst for change. Travis James Bays, co-owner of Bodhi Surf School (his official title is "changemaker"), says he wants to go plastic-free because he doesn’t want to be hypocritical. He believes in using non-toxic, biodegradable alternatives to plastic, and he wants others to do the same. After all, Bodhi Surf School asks all of their guests to pledge to be Ocean Guardians. In order to be authentic in this request, the Bodhi Surf team must live it. Bodhi Surf will soon construct a budget to begin purchasing these alternatives. Travis hopes to use the plastic products from the past, along with presentations and videos from Life Without Plastic and Geoporter, to create a traveling workshop, where he and others in the community can lead local businesses in Bahia Ballena toward using as little plastic as possible in the future. The journeys of individuals like Beth Terry, Jay Sinha, and Chantal Plamondon are glimpses of hope. These are models and activists for a new Earth—free from plastic pollution. Although these people lead busy lives, they are making time for something that affects us all, and they are sharing their journeys away from plastic dependency, with hope that those ripples will reach and inspire others. Our choice to use plastics has a ripple effect. All of our decisions do. The repercussions from what we do extend infinitely outward, and we help choose what those extensions are made of. The folks at Bodhi Surf have decided that theirs will surely not be made of plastic.